Winnebago Industries, Inc. the nation's leading motor home manufacturer, unveiled four exciting new motor home models at a press conference held at the 44th Annual National RV Trade Show in Louisville, KY.
With an emphasis on innovation and value, Winnebago Industries has introduced the new 2007 Winnebago Vista and Itasca Sunstar and the 2008 Winnebago Destination and Itasca Latitude. The new 2007 Vista and Sunstar are entry-level Class A gas motorhomes that are available in 30- and 33-foot lengths with a full complement of features and an abundance of interior and exterior storage. 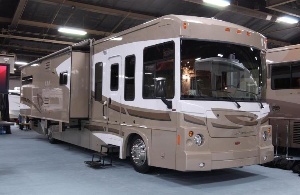 Also making their debut at Louisville are the new 2008 Winnebago Destination and Itasca Latitude. Each are available in two floorplans and each offer the choice of a gas or diesel chassis in the same models. These impressive new products are available on either the brand new Workhorse UFO rear engine gas pusher chassis or the optional Freightliner XC rear engine diesel chassis in both 37- or 39-foot floorplans. Designed from the ground up to take full advantage of these pusher chassis configurations, the Destination and Latitude have a striking appearance both inside and out. Exterior features include an expansive one-piece windshield and full body paint with fresh, contemporary styling and exterior graphic designs. The new Destination and Latitude also feature an automotive-styled dash, an integrated entertainment center with a high-definition 30-inch flat-screen TV and home theater system, stunning curved cabinetry available in two-tone Honey Cherry with Washed Maple accents, or Honey Cherry wood throughout and contemporary décor, including furniture styling that combines both UltraLeather and fabric combinations reflecting upscale residential design trends.